Coconut Oil: What Is All The Fuss About? You’ve probably already heard a ton of information about coconut oil and all of its benefits. However, with all of the information floating around, it’s hard to tell what’s actually true. Some sources claim that coconut oil will help you lose weight, reduce risk of heart disease, it can be used as a sunscreen, and more. There’s also the confusion of which type to use, refined, unrefined, organic, fractionated and unfractionated. Which one do you use? Let us help you understand everything there is to know about coconut oil, why we love it, and some of our favorite ways to use it. First of all, you always want to make sure you’re using organic coconut oil. Look for a label that says USDA Organic. This means that the coconuts were grown without the use of pesticides. 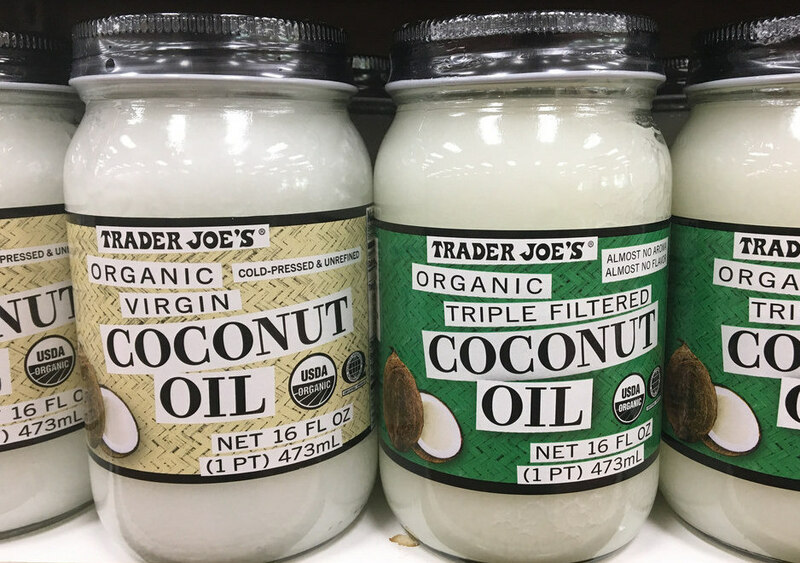 The type of coconut oil you use depends on what you plan on using coconut oil for. Refined coconut oil is primarily used for cooking. Check to make sure it has been refined using friction, heat or gravity. Not chemicals. The refining process takes out a lot of the coconut flavor. It also causes it to have a higher smoke point, which makes it useful when cooking foods at higher temperatures. Unrefined, or raw coconut oil is made from fresh, raw coconut meat. You will get more coconut flavor with unrefined coconut and has all of the natural benefits of a coconut. All coconut oil is liquid whenever it is above 75 degrees. If the temperature goes below 75, it will become fattier solid. It is okay to store coconut oil in any state, refrigerated or not, but should not be kept in direct sunlight. You can also buy fractionated coconut oil, which has the long-chain fatty acids removed, so it always stays in a liquid form. This type also has a longer shelf-life (up to 5 years). Fractionated coconut oil is the easiest to use for skin and hair care, as well as oil pulling. It promotes tanning. It doesn’t have a sun filter but helps the pigment of the skin become darker. Can be used in perfumes as the oil keeps well and is odorless. Because of the fat content, it can be used in protective skincare products such as hand and foot creams or lotions. If you’re looking to use coconut oil for skin or hair care, it’s easier to use a liquid form. However, even if you use unfractionated coconut oil, just rubbing it between your hands will transform the coconut oil into liquid. Unfractionated coconut oil can be used for many of the same uses as fractionated coconut oil. However, it’s not as smooth and easy to use. Even after melting it, you can still be left with clumps. It is a more natural form of coconut oil though, rather than a man-made product. The shelf life is much shorter, only about 2 years. The rate it takes unfractionated coconut oil to soak into your skin is also much slower. Due to the 100% solid fatty acid content, coconut oil should not be used on oily, large-pored or acne-prone skin. It’s possible that coconut oil could further enlarge pores or clog them. • Use it for oil pulling, studies show it will help to whiten teeth! • Use it before and after going to the beach. It will moisturize the skin and offer some natural antioxidants and SPF. • Use it as sunscreen. It has some protective benefits, but not enough to keep you from burning. • Use it as a hair treatment. Apply to the ends or all over to moisturize and encourage growth. • Apply it to your hair shortly before you have plans, there’s a chance it won’t wash out very easily. • Use it in cooking. With its unique combination of fatty acids, it can help you lose weight. • Expect major results. There are only a few studies that have noted small amounts of weight loss. • Take a tablespoon of coconut oil as often as once a day. It can boost your mood and offers minor health benefits. • Take too much. It is a fat after all. As you can see Coconut oil is extremely versatile and has many amazing benefits. We’d love to hear your favorite ways to use coconut oil. Comment below or tag us on Facebook/ Instagram!